Kurt Vonnegut is one of my favourite writers. I say "one of" because it's impossible to choose only ONE. Vonnegut's writing sometimes appears simple, but his humour and his perception of human nature are so keen, an astute reader knows the author worked tirelessly at his craft. If his prose comes across as terse, it's done with a goal in mind. In his novels, the reader (or at least this reader) is struck dumb every so often by a powerful passage brought into sharper relief by the apparent simplicity of its presentation. One of the most well-known is this section of Vonnegut's most famous novel, "Slaughterhouse-Five". If you haven't read it, you should. My favourite Vonnegut novel is "The Sirens of Titan". I hesitate to call it pure science-fiction since terms like chrono-synclastic infundibulum are playful and coy rather than an attempt at plausible, futuristic science. Sirens addresses morality, free will, sexuality, religious paradoxes and the meaning of life in a novel you could probably read in a weekend. It's easy to overlook it, and easier to forget how talented Vonnegut is (was?). Sometimes you take things like Vonnegut novels or Laphroaig Scotch whisky for granted. Then they cross your path anew and it's a stark reminder of how good they are. Wait, Laphroaig Scotch whisky? Wasn't I just talking about Kurt Vonnegut? Like the ending of The Sirens of Titan, it all makes sense, I promise. 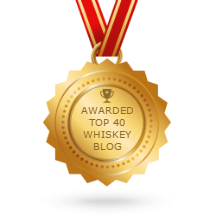 Laphroaig (la-FROYG) has a great website (click here)....when it works. I won't re-iterate all of the information contained therein, but check it out if you have the chance. Using a browser other than Google Chrome seems to deliver the best results. Laphroaig draws its soft, peated water from the Kilbride stream. The stream itself was the object of a court battle, which Laphroaig won, in the 1930s. I think the litigation was resolved in a trial by combat using only the ancient Scottish martial art of ¡ Fa-cue ! Maybe not. Then there's the Laphroaig peat. Oh ! The peat ! Islay whiskies are known for their smoky, peaty profile. But the peat on the little Hebridean island is different than that of mainland Scotland. In fact, the peat on Islay varies from one location to the other. The Glenmachrie peat bog, has a particular mix of heather, lichen and moss responsible for Laphroaig's smoky, iodine-like and medicinal profile. The peat is dried for three months before being used. Unlike the majority of distilleries, Laphroaig peats the malt before they dry it. In a process lasting around 17 hours, the smoke or ‘peat reek’ rises up through the perforated drying floor into the kiln. The vaporised oils – the peat’s phenolic compounds and other wood-based smoky flavours – are absorbed by the damp barley. Laphroaig burns their peat at a relatively low temperature, a ‘cold smoking’ process that is responsible for the tarry note of Laphroaig. This may not sound appealing to the whisky initiate, but Laphroaig's flavour makes me feel like Bill Murray did in that dinner scene in "What About Bob?" I'm sure my friends and family members are glad that I keep this reaction (mostly) to myself. But make no mistake; inside my head, I'm doing this the whole time I'm drinking Laphroaig. Adding water to Laphroaig 10 really pains me. It's just so perfect when sipped neat; adding water seems criminal. Maybe not criminal; uncivil perhaps. But I added water, you know, just to be thorough. With water, the nose shows much more fresh seaweed/iodine and vanilla. The smoke is pushed into the background. The palate becomes much more medicinal, developing toffee, black coffee before finishing with sweet vanilla and cigar ash. With or without water, this is an absolute treat. It's easy to take things for granted. Much like reading (or re-reading) Kurt Vonnegut's novels, I'm always taken aback when I drink Laphroaig. I think to myself "Why don't I buy this more often?" 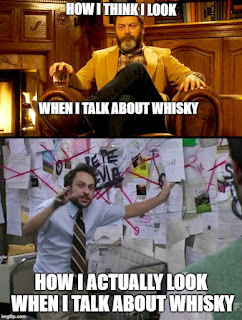 or "Why do I need to try different whiskies when Laphroaig, Lagavulin and Ardbeg are all I really need?". Now, appreciating Scotch whisky is a journey and no journey is truly complete if you never venture beyond the tried and true. But it's nice to come back to what you know. If you haven't been there in awhile, you might just be surprised. I highly recommend you try Laphroaig 10 or re-visit it if you haven't had it in awhile. Joe - great writing and review. I love how you use media and literature to find an access point into your whisky experiences. Entertaining stuff. Cheers. PS. Have you tried highland park 18? Glorious stuff. The smoke floats on the perimeter and has a completely different feel to islay peated drams. Worth trying. Thanks for the kind words. I had HP 18 at a good friend's place recently. I've long been a fan of their 12 Year Old expression as well. I'm not sure the 18 is worth 2 1/2 times the price of the 12, but it's definitely a great dram.